He joyfully concluded countless Thanksgiving day parades last week, and no matter where you are over the next month, you'll see countless images of Santa Claus as we usher in another Christmas season. But did you ever stop to think where Santa himself came from? We decided to do a little "genealogy" by looking into the origins of Santa Claus and the folklore family members that contributed to how we imagine Father Christmas today. Check out who we rounded up and put into Santa's family tree. 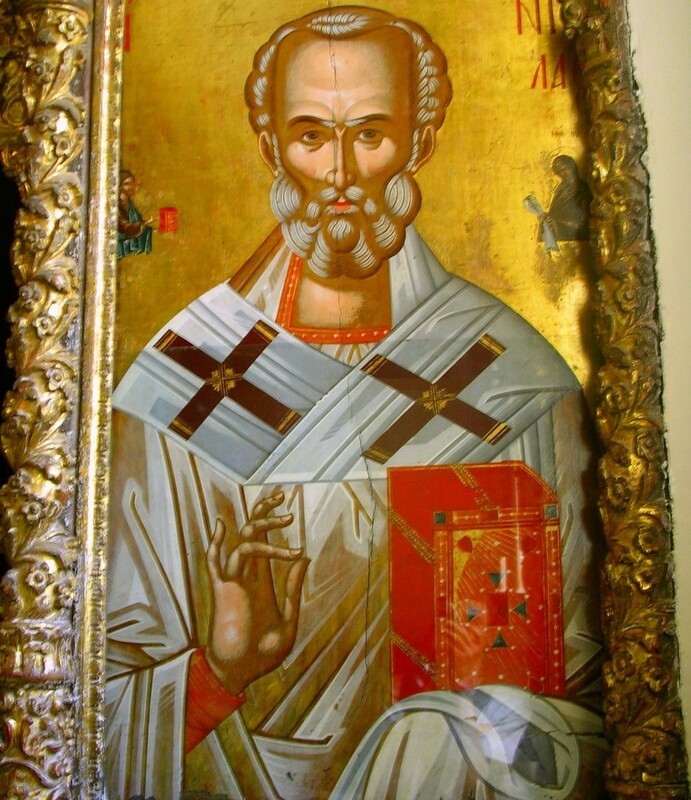 St. Nicholas was a 4th century Greek bishop who was famous for aiding the poor. In a well-known tale of St. Nick's exploits, he supplied a family with dowry payments for their three daughters with his own inheritance. In a secret night-time visit, St. Nicholas dropped three bags of gold coins into three stockings hung by the fire to dry (in later versions he snuck down the chimney), allowing the daughters to find suitable matches and preventing the family from shame and misfortune. 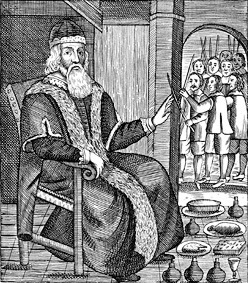 This tale seems to have given rise to the reputation of St. Nicholas as a gift giver - in Medieval Europe children were given gifts the night before St. Nicholas' day, December 6th, and his name has now become synonymous with Santa Claus. 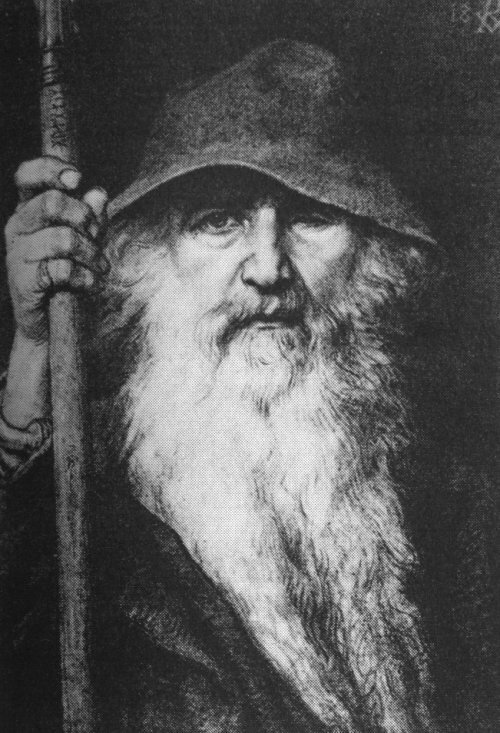 You might be surprised to see the fearsome Norse God Odin on this list, but after looking at the above picture, his connection to Santa may not seem so far fetched after all. As you can see, there was little visual resemblance between St. Nicholas and Santa Claus, but the modern-day image of Santa was clearly influenced by Odin. Before the Christianization of the German people, they celebrated a midwinter holiday called Yule. Many traditions of this holiday were absorbed into Christmas to encourage participation. Like our Santa Claus, Odin rode through the sky during the Yule season on a giant equine - the gray 8-hooved horse Sleipnir can be considered a predecessor to the Santa's reindeer. Odin's long white beard and gift-giving tendencies were also emphasized Yuletime lore. 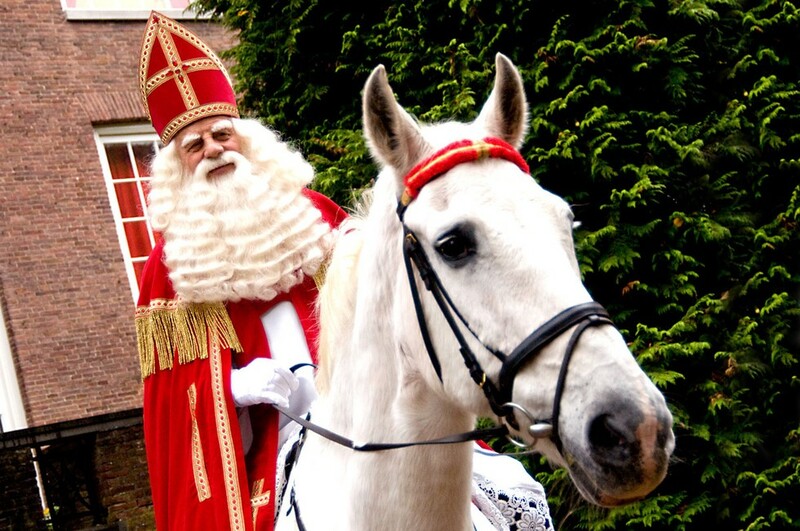 In many ways, the Dutch mythical figure Sinterklaas is a combination of St. Nicholas and Odin. Sinterklaas also refers to the annual gift giving holiday in the Netherlands, which takes place either the day before or morning of St. Nicholas' day (December 6th), depending on the region. Sinterklass is an elderly man with long white hair who wears a long red cape and rides a white horse. Just as Santa Claus arrives at the end of the Thanksgiving Day parade, Sinterklaas traditionally arrives on a steamboat from Spain every year around mid-November, a nationally televised event in the Netherlands. Another trait shared with our Santa Claus is an early version of the "naughty or nice list" - Sinterklaas carries a book in his hand that contains behavioral records of all children over the past year. We can think of Father Christmas as a distant, perhaps even long-lost cousin to Santa Claus. Father Christmas has been around since the 17th century and is traditionally the symbol of the adult celebration of Christmas - feasting and drinking. Though he doesn't share the gift giving tendencies of Santa Claus or his more direct forefathers, Father Christmas shared the task of ushering in the holiday season in centuries past. Unfortunately, in modern times has become eclipsed by and slowly conflated with Santa. Father Christmas' origins lie in 17th century England when Puritans were rallying against many forms of Christmas merriment. In the many debates, proponents of a more liberal Christmas celebration would often personify Christmas as a warm, kind of man who was receptive to having a good time, but not prone to overdoing it. He remained a mascot of restrained revelry until the mid 19th century when he slowly began to be overtaken by and confused with Santa Claus. Mrs. Claus may not be an ancestor of Santa but she's certainly in his family tree! 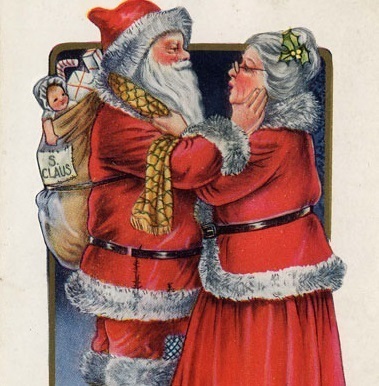 Mrs. Claus made her first appearances in American literature in the mid 19th century. She was mentioned only in passing until closer to the early 20th century, but has since grown in her representation and is now a key part of the legend of Santa Claus in popular culture. Although Santa and Mrs. Claus almost never have children in any of their many depictions, there is at least one "Christmas Burlesque" musical from 1892 that features "Kitty Claus", the daughter of Santa Claus. Not surprisingly, it wasn't a classic. We're afraid it looks like Santa's family tree ends with he and Mrs. Claus for now!